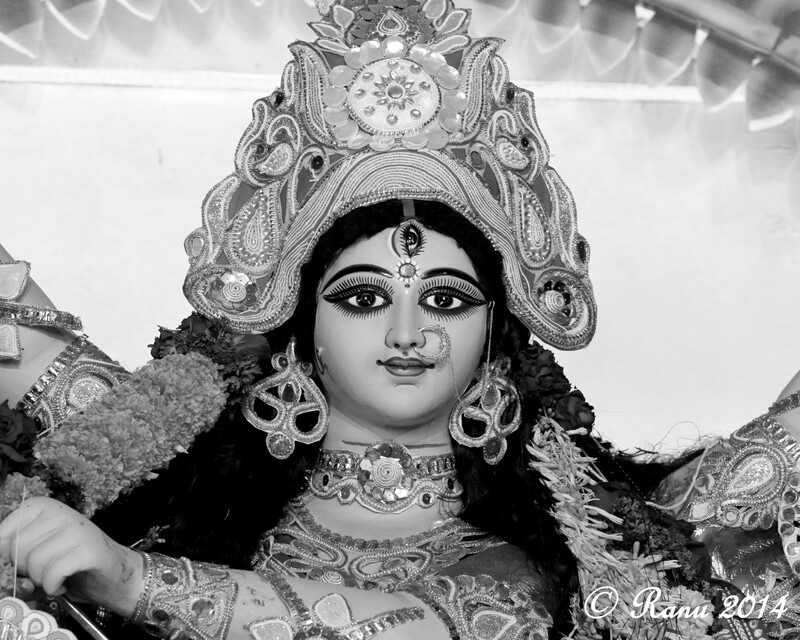 Durga Puja is the biggest festival for Bengalis all over the world. Wherever there are Bengalis there is bound to be at least one puja. I grew up 1000s of km away from bengal. I have never seen the Durga Puja in Kolkata. For me this is very grand. When I was young we had three pujas in my city. Now there are almost 20 of them, with the home puja celebrating its 75th year. It is the time that Bengalis believe that Ma Durga visits her mothers house with her children and pets for 5 days. Strangely for us bengalis these days Durga puja is not much about the rituals of the puja but more of the fun around it. Could be our Communist heritage 😀 . Puja always meant a lot. It was a shift away from the mundane life to an exciting interesting and different life that we led for 5 days. Puja meant new clothes, new shoes, lots of junk food (which I was never allowed) and watching functions…. plays, ballets, orchestras, musical shows, dance dramas and Bengali movies till the wee hours of the morning, only to go back for a few hours of shut-eye and be back for the pushpanjali. Functions had orchestras and artistes from Kolkata introducing the likes of me to new genres of music. I fell in love with folk music because of its rustic nature and I loved the no pretense song of the heart. Durga Puja was a time when I was reminded of my Bengali roots and learned everything Bengali in those 5 short days. Bengali food, Bengali sarees, Bengali love for politics and football, Bengali debates on everything, Bengali adda etc…. Rest of the year I spoke Bengali only at home with my parents and sisters. It was mostly English Hindi and Marathi. On these 5 days since we interacted with so many more Bengalis and spoke the language on a 24 hour basis…… the language improved considerably. The puja is almost like a fashion show with the men and women strutting around in their best clothes jewellery and makeup. Saris of Katha, tangail, silk, organza, embroidery, baluchari, south silks, muga, etc etc all can be seen on these days. Men wear kurtas and dhoti or churidar of cotton silk embroidered batik. There is no limit to what you wear on these days. You can easily get away looking like a rainbow or a peacock or a jewellery store or something out of the 17th century. Nobody will raise an eyebrow….. These 5 days everything is allowed….. no rules. On the home front nobody cooks these 5 days. The kitchen is closed. Lunch is usually bhog of khichdi labda tomato chutney and payesh at the pandal. Ashtami is special. It usually has a different menu of fried rice and aloo gobi and beguni. All of this in the Puja Pandal. Dinner is usually a wide array of junk food of biryanis, chicken cutlets, or mochar chop, devilled eggs, or radhabalabi and chole. Not to mention the famous bengali sweets….. rosogolla, chamcham, sandesh, ladyginni, chitrakoot, langcha etc etc. The food list is endless. In between all this you keep sipping tea and soft drinks icecreams and some or the other fried stuff and sweets. Basically these 5 days all rules of all kinds are broken. Durga Puja is fun frolic something I wait for all year. The 5 days pass so quickly…… and I am always heartbroken to see Ma Durga go back only with a promise of returning back the next year. Durga Puja is always so colorful and bright. I tried to monochrome three of the pics and still keep the essence of the whole festival in black and white.